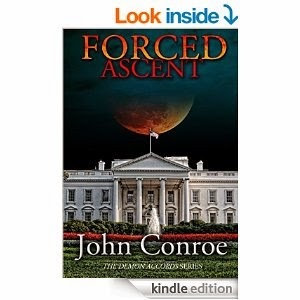 Forced Ascent by John Conroe. Chris Gordon has never had an easy relationship with the White House. Now, after rescuing his goddaughter from a secret base in New Hampshire, it’s reached a new low. You drop one little asteroid onto the continental United States and the entire government goes crazy. On top of that Halloween is fast approaching and demons are popping through into our world every which way. Forced into the world of high level politics, Chris and Tanya and their merry crew will have to stay two steps ahead of just about everyone if they’re going to have a chance in hell of preventing all Hell from breaking loose. If you follow my blog then you may have read my earlier post on the Demon Accords series by John Conroe and how utterly fantastic I found each and every single book in the series. Without doubt Demon Accords is one of my - if not the - favourite urban fantasy books I've read. And it came as quite a pleasant surprise when I found out the latest book was out. It was like Birthday and Christmas all rolled up in one. I'm not going to go too much into the plot as it's the 7th book in the series and if you haven't read the others then you'll be lost. What I will say is that John Conroe doesn't drop the ball with this one and if anything raised it. Storyline was gripping and expands significantly, action scenes were adrenaline fuelled and such was the pace of the book that I finished it within a day. I can't think of anything I disliked but perhaps that's my biased view clouding my judgement. If you haven't read the Demon Accords series and you claim to be a urban fantasy fan then you seriously need to have a good hard look in the mirror. For those of you who have, then you won't be disappointed.